Brianna Decker and Gigi Marvin scored for the United States in a 2-0 win over Canada to open the women's world hockey championship. There was extra emotion in the U.S. women's centre-ice hug following their 2-0 win over Canada to open the world hockey championship Friday. The Americans not only shook off the drama that preceded their tournament, but feel they're a stronger team after collectively demanding more financial support from USA Hockey and getting it. The host country and defending champions didn't report to training camp and had threatened to boycott the world championship on home ice if their federation didn't give them more of what the men's teams get. The U.S. women lacked on-ice preparation with just two practices together and no pre-tournament games, but exercising their bargaining power was the ultimate team-building activity. "We're so united," U.S. forward Gigi Marvin said. "We were itching to be on the ice and it was displayed beautifully tonight, the unity, the support around the ice. "It was something that means a lot especially after what we went through." Brianna Decker scored late in the second period off a feed from Megan Bozek. Marvin scored the second goal threading a shot from the point through traffic early in the third. Goaltender Nicole Hensley collected an 18-save shutout. Edmonton's Shannon Szabados, playing in her first international tournament for Canada since the 2014 Olympics, stopped 26-of-28 shots in the loss. The U.S. takes on Russia (1-0) followed by Canada versus Finland (0-1) in Saturday's Pool A Games. Canada scored a combined eight goals to beat the U.S. in a two-game series in December, but their attack was lukewarm Friday. The Americans carried a 20-9 margin in shots into the third period. The Canadians had a couple chances in the second period to strike first. Captain Marie-Philip Poulin hit the post five minutes into the second period and Meghan Agosta put a backhand off the post on a partial breakaway with seven minutes remaining. Canada outshot the Americans 10-9 in the third, but the Canadians were held to the perimeter for the most part. "We kind of stuck to the outside," Poulin said. "We put the puck on the net, but we didn't battle. We have to play with more heart and play better." The Canadians were coming off a week-long training camp, including a pair of exhibition games against boys' teams in Leamington, Ont. Canada and the U.S. have met in every world championship final dating back to the first one in Ottawa in 1990. The U.S. has won six of the last seven titles. The women's hockey rivalry between the two countries is one of the most intense in sport. The Canadians could see their opponent was particularly inspired Friday. "It was a big thing for female sports and they got it," Poulin said. "I think it was a big emotional game for them tonight." The host team was greeted warmly with chants of "U-S-A" and the waving of numerous stars and stripes flags. Attendance was 3,125 in the 3,500-seat international ice rink at USA Hockey Arena. Poulin scored the overtime winner and Szabados stopped 27 shots to beat the U.S. and win Olympic gold in 2014. Szabados then returned to men's hockey, where she's spent most of her career, playing in the Southern Professional Hockey League for just over two seasons. 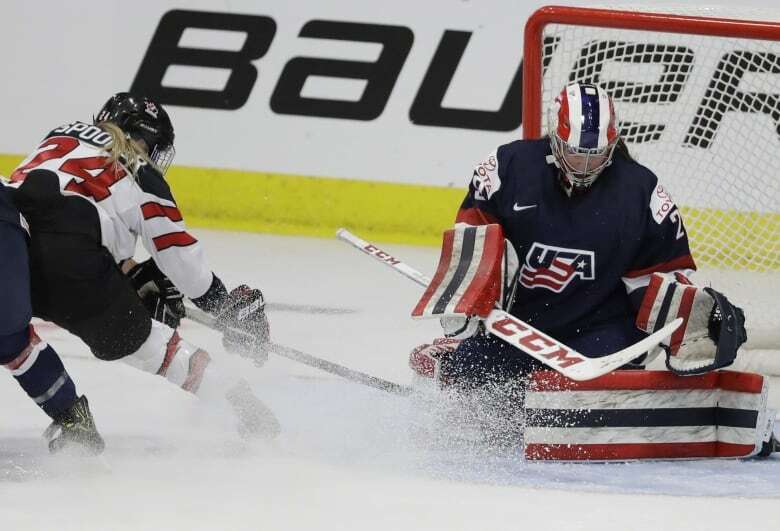 Canada went 1-7 against the U.S. post-Olympics before the December series, in which Szabados earned both wins with 32 saves in relief of injured starter Ann-Renee Desbiens in Game 1 and 23 saves in Game 2. "She's our backbone," Poulin said. "We've got to help her out." In the other Pool A game, Yekaterina Smolentseva scored a power-play goal with 50 seconds remaining to lift Russia to a 2-1 win over Finland. The Finns didn't play their scheduled pre-tournament game against the United States because of the dispute. Russia was without forwards Olga Sosina and Anna Shokhina serving one-game suspensions for their match penalties in an exhibition game Tuesday against Switzerland. Sosina, Russia's leading scorer in last year's world championship, was penalized for kicking a player, while Shokhina took a tripping penalty 69 seconds before the end of regulation time. In Pool B, promoted Germany upset Sweden 3-1 and Switzerland edged the Czech Republic 2-1 in a shootout. The medal games will be played April 7.